The climax of A Tree Born Crooked is not in action but a moment of poetry, the retelling of a dream. This is a novel which doesn’t pull its punches, gives us angsty characters in messy confrontation, but its true power is in its stillness. The descriptive quality of Steph Post’s prose carries the reader into the dark and confusing world of three characters trying to undo a knot of crime which one has inadvertently tied. Here is a setting familiar to its protagonists yet turned over and over like dry earth to set the scene for their journey. There is such joy in the detail which places the reader in a Florida of cheap motels and aching hearts, Christian fervour and petty violence that the plot unravels almost like a film. It is hard not to imagine who might play the central characters in its movie incarnation. 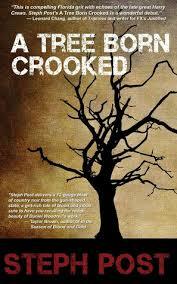 A Tree Born Crooked in filmic terms is as dark as the Cohen Brothers’ road thrillers with an injection of Irvine Welsh. Twice Post gives her characters poetry, Frost then Yeats, to dredge up and reflect on. From trailer parks and dingy bars, in houses where daytime television blares and fluorescent-coloured sodas are the norm, recollection of the literary canon might seem a paradox. Yet it is in this weaving of mundanity and great beauty, aggression with tenderness that the reader is captured. There is nothing pretty about the exchanges between characters but we listen in because beneath the bravado we sense their raw humanity undimmed by circumstance.